I am back from the white slopes in Switzerland and time for a tip. When we drive to Switzerland we frequently make a stopover at Hotel Sonne (the Sun Hotel) in the very center of Offenburg. Offenburg is next to the Motorway (Autobahn) Frankfurt – Basel, between Baden Baden and Freiburg. It is also easy to reach from Strasbourg in France. They have a courtyard where you can park your car without the necessity to unload all your luggage. Offenburg is a nice small town and a good basis for exploring the German Schwartz Wald (Black Forrest) or the French Elzas. 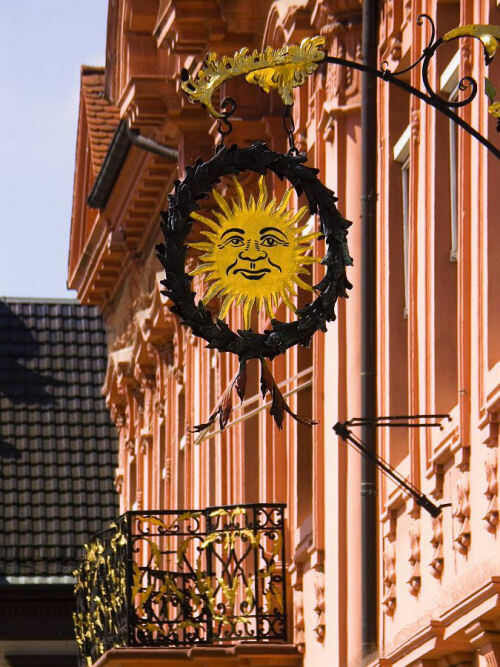 Hotel Sonne is first mentioned in 1376. So it is probably more than 630 years old. In any case it is run by the same family already since 1858. In 2008 they will celebrate their 150 years of operating the hotel! In the two very old townhouses is the “Old Wing”. Next to and behind the courtyard is the “New Wing”. We prefer the Old wing, because of its character, its beautiful wooden stairs and antique furniture and because the bathrooms of most rooms have been redecorated more recently. Room 31 still needs redecorating and we rather avoid, because of the squeaking of the floorboards and the antique bed. Dad and mum of over 80 of the present owner Gabi are still helping out. I admire the fact that both even can handle their computerized reservation system. Gabi’s husband Horst operates their excellent restaurant.